Sooke's fishing this week has been good. 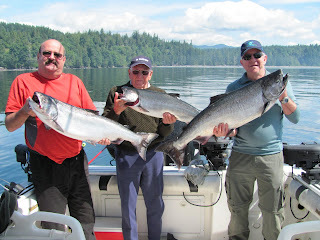 The migratory springs/king/chinook salmon are passing through, with many salmon caught in the 20s and a few in the 30s. Most of the action has come from Possession Point and Secretary Island. Gord from Foghorn Fishing Charters has found his way into a few nice spring salmon, with these happy guests from Australia showing off their catch. Good on ya! With the recent fishing regulations updates, Sooke anglers can now keep one chinook salmon larger than 67cm, and then another between 45-67cm if it is a hatchery fish only (missing adipose fin). So get out to Sooke and drop a line, the fish are there ... you can't catch them sitting at home.